Calvary is the hill outside of Jerusalem where Jesus was crucified, or so the story goes. While it opens with a quote that references this event, Calvary does not require extensive Biblical knowledge or deep-seated beliefs to understand and appreciate its theology. All that’s required is a pulse. Writer-director John Michael McDonagh’s wordy yet punchy script artfully supplies proper doses of dark comedy and even darker tragedy with a refinement that avoids self-righteousness. 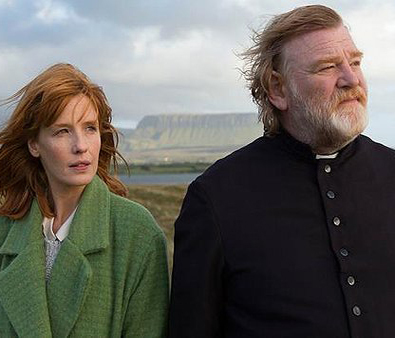 Any virtue not extolled in the prose is written on Brendan Gleeson’s weathered face in an extraordinary performance as a priest bearing the burdens of his congregation while facing his own mortality. Father James Lavelle (Gleeson) is threatened by an unseen parishioner in the confessional booth. The man explains that he was molested by a priest as a young boy. Since that priest is long dead, the man will kill Father James – a “good priest” – in one week’s time to extract his pound of flesh from the Catholic Church. The man suggests the beach of their quaint coastal Irish village would be a good spot for the execution. As the days of the week are counted down, Father James goes about his priestly duties, tending to his flock regardless of how unreceptive they may be to his guidance. Many, it seems, line up for communion out of habit rather than reverence of the sacrament. 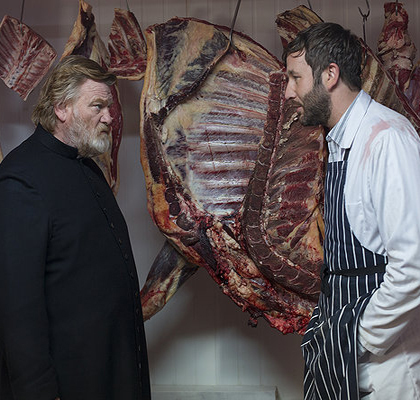 To its credit, Calvary doesn’t play up the mystery of identifying the potential murderer – Father James knows who it is, we do not; it’s more concerned with the process of putting his house in order. 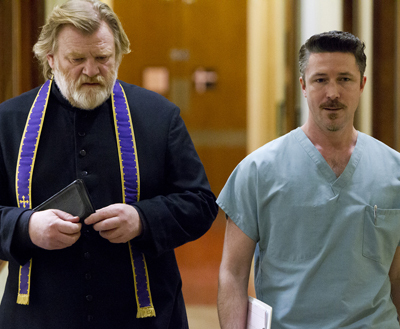 His scarred community is in need of spiritual healing, and damaged daughter Fiona (Kelly Reilly) – he was married pre-priesthood – has understandable abandonment issues. From restrained horror in reacting to stories of child abuse to dealing with the tribulations in his town, Gleeson posits a man willing and able to bear the weight of this world. He’s a good-natured superhero of sorts, outfitted in a cape-like, dusty old cassock, but he’s a flawed crusader who succumbs to the bottle in a moment of dimness and acknowledges mistakes made with his daughter. What cannot be questioned are Father James’s honesty and virtue. He makes every attempt to be genial, but is also brutally honest when called for, including telling fellow priest Father Leary (David Wilmot) that he has no integrity. Not many people in this town do. Daft butcher Jack (Chris O’Dowd) may have slapped around his cheating wife Veronica (Orla O’Rourke). If it wasn’t him it was her lover Simon (Isaach de Bankolé), who flicks a lit cigarette at Father James when gently questioned. Atheist Dr. Harte (Aidan Gillen) refers to last rites as “gobbledygook” and is quick to point out the mistake Fiona made in her suicide attempt. Privileged and pompous Michael (Dylan Moran) drinks to numb the pain of being a fraud. Even the most welcoming denizen, an elderly author (M. Emmet Walsh), asks Father James to supply him with a gun so he can control when and how he dies. The worst of the worst, incarcerated serial killer Freddie (Domhnall Gleeson, Brendan’s son), isn’t even a suspect in the threat, but adds a disquieting quality to the film in a superbly acted scene between father and son. Or, Father and wayward son. There are many characters to keep tabs on, but McDonagh manages the story threads in a way that’s purposefully overbearing, but easily understandable and, more importantly, meaningful. 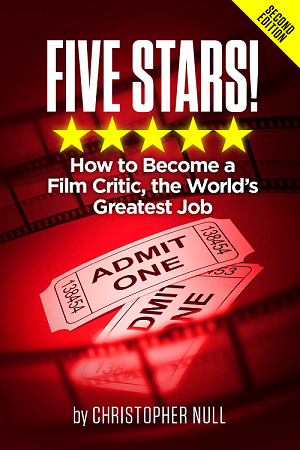 There are some extraneous sorts – an unimpressive cop (Gary Lydon) and a male prostitute (Owen Sharpe) – who exist as plot convenience or too obtuse allegory that feel unnecessary. The gallows humor of the script is undercut in spots with self-aware cheekiness: “Certainly a startling opening line,” or, “How’s that for a third act reveal.” But even when surrounded by inessential characters or reciting the occasionally imprudent line, Gleeson carries Calvary with just as much aplomb as Father James carries his responsibilities. Gleeson’s studied, magnetic performance anchors McDonagh’s blending of tone and Larry Smith’s ethereal cinematography. Father James is a man trapped in a landscape of lapping waves and lush mountains, wading through the convolution of simplistic village life and thorny religious doctrine. 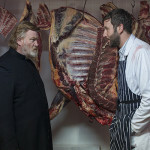 Calvary is a passion play that pulls no punches, nor completely extinguishes hope, as it moves to a gutting conclusion. It’s a conclusion that, as these things go, is just a line of demarcation signifying new beginnings.